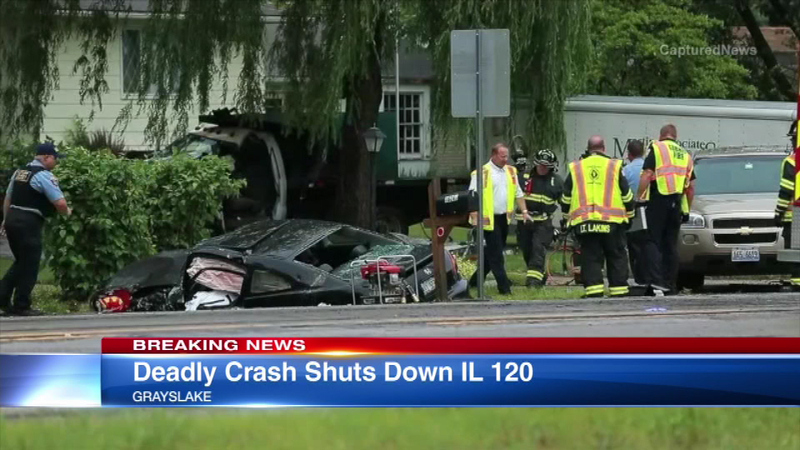 GRAYSLAKE, Ill. -- One person was killed and two other were hospitalized after a deadly four-vehicle crash near Grayslake near IL-120 and Battershall Road, officials say. The Lake County Sheriff's Office released a statement saying at around 1 p.m. a landscape truck with a trailer heading eastbound in the 18200-block of Route 120 crossed the center line and sideswiped a dump truck traveling westbound. The landscape truck then hit a westbound Honda Civic and a Ford van. The driver of the Honda was killed, police say. The driver of the landscape truck and the man driving the dump truck were both taken to Advocate Condell Medical Center in Libertyville in unknown condition. A passenger in the landscape truck and the van's driver were treated at the scene and released. IL-120 between John Mogg Road and Mills Road is temporarily closed due to the crash, according to the Illinois Department of Transportation. No citations or charges had been issued as of Monday evening as police investigate. The Sun Times Media Wire contributed to this report.